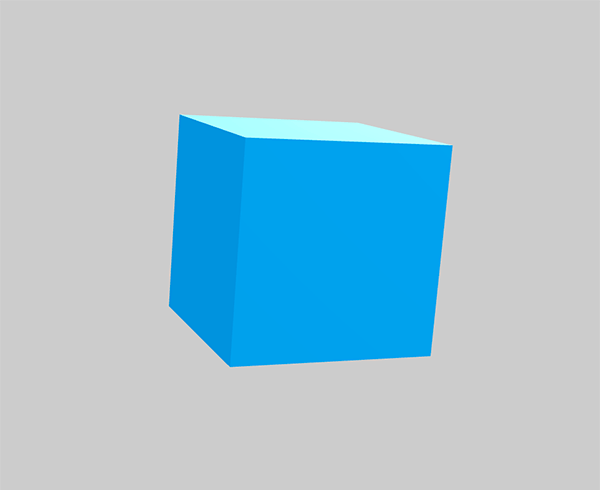 We will try to create a simple demo first — a cube rendered on the screen. If you have already worked through our Building up a basic demo series with Three.js, PlayCanvas or A-Frame (or you are familiar with other 3D libraries) you'll notice that Babylon.js works on similar concepts: camera, light and objects. Making sure you are using a modern browser with good WebGL support, such as the latest Firefox or Chrome. Creating a directory to store your experiments in. Saving a copy of the latest Babylon.js engine inside your directory. Opening the Babylon.js documentation in a separate tab — it is useful to refer to. It contains some basic information like the document <title>, and some CSS to set the width and height of the <canvas> element (which Babylon.js will use to render the content on) to fill the entire available viewport space. The first <script> element includes the Babylon.js library in the page; we will write our example code in the second one. There is one helper variable already included, which will store a reference to the <canvas> element. Before reading on, copy this code to a new text file and save it in your working directory as index.html. The BABYLON global object contains all the Babylon.js functions available in the engine. Thus, the scene is created and the second line sets the background color to light gray. To make the scene actually visible we have to render it. Add these lines at the end of the <script> element, just before the closing </script>. We're using the engine's runRenderLoop() method to execute the renderLoop() function repeatedly on every frame — the loop will continue to render indefinitely until told to stop. Now the setup code is in place we need to think about implementing the standard scene components: camera, light and objects. Let's start with the camera — add this line to your code below the scene creation and the line where we defined the clearColor. There are many cameras available in Babylon.js; FreeCamera is the most basic and universal one. To initialize it you need to pass it three parameters: any name you want to use for it, the coordinates where you want it to be positioned in the 3D space, and the scene you want to add it to. Note: You probably noticed the BABYLON.Vector3() method in use here — this defines a 3D position on the scene. Babylon.js is bundled with a complete math library for handling vectors, colors, matrices etc. The parameters are very similar to the previously defined camera: the name of the light, a position in 3D space and the scene to which the light is added. A mesh is a way the engine creates geometric shapes, so material can be easily applied to them later on. In this case we're creating a box using the Mesh.CreateBox method with it's own name, a size of 2, and a declaration of which scene we want it added to. Note: The size or position values (e.g. for the box size) are unitless, and can basically be anything you deem suitable for your scene — milimeters, meters, feet, or miles — it's up to you. The box looks black at the moment, because we haven't defined any material to apply to its faces. Let's deal with that next. The StandardMaterial takes two parameters: a name, and the scene you want to add it to. The second line defines an emissiveColor — the one that will be visible for us. We can use the built-in Color3 function to define it. The third line assigns the newly created material to our box. We have a box on the scene already; now let's try adding more shapes. It looks similar to the box element — we're creating the standard material, giving it a grayish color and assigning it to the torus. The cylinder parameters are: name, height, diameter at the top, diameter at the bottom, tessellation, height subdivisions and the scene to add it to. It is then positioned to the right of the cube, rotated a bit so its 3D shape can be seen, and given a yellow material. This works, but it is a bit boring. In a game something is usually happening — we can see animations and such — so let's try to breathe a little life into those shapes by animating them. The t variable will be incremented on every rendered frame. It will rotate the box along the y axis. There's a little bit of adjustment made to make the animation look and feel nice. You can experiment with the values and see how it affects the animation. The cylinder will float up and down on the y axis thanks to the Math.sin() function. You can also see it on GitHub and fork the repository if you want to play with it yourself locally. Now you know the basics of Babylon.js engine; happy experimentation!